The peoples dashboard is intended to be a critical layer on top of six different social media platforms: YouTube, Facebook, Twitter, LastFM, LinkedIn, and Instagram. For each of these platforms the following features are highlighted: navigation, platform, people and mix. In order to discover peoples data, an interface analysis was performed by collecting the language and all elements from the various platforms. In the digital age, people are likely to use and generate content on social platforms without being concerned about the structures and algorithms in the background of the online networks. Online content is increasingly metrified, processed, computationally and algorithmically aggregated and rearranged. As Mahnke and Uprichard argue, we are living an algorithmic turn in the whole world is strongly driven by computational algorithmic technology (Mahnke and Uprichard, 2014: 259). The social networks interfaces and dashboards show numbers, trends and feeds, with the purpose of empowering the user to have control over the content. However, the influence of the continuous automated processes is usually hidden and the information presented is often an assemblage of content produced by the users, by the platform and both. Considering the increasing importance of social media in peoples lives to find, foster and maintain meaningful connections to information, people, movements, and in all, the world at large (Langlois, 2014: 51), it is more and more necessary to develop a critical point of view over these platforms. During the DMI Winter School 2015, we aimed to identify human-driven data on six different social platforms: Facebook, Twitter, Instagram, Last.fm, YouTube and Linkedin. The purpose was to spot the peoples data and create awareness regarding the large automated content generated by the platforms. The analysis was conducted with the intent of creating a peoples interface per social media platform, what we called Peoples Dashboard. In parallel, an experiment also tried to understand how the networks balance human and platform content over time. By analysing the various elements of the existing interfaces, the Peoples Dashboard is a critique on social platforms towards a more transparent approach. It tries to reveal part of the internal engines and shows what is automated and what is peoples data (what has actually been contributed by oneself/friends/connections/followers). In other words, it tries to increase the understanding of what is actually social on social media nowadays. How to create a dashboard that detects and renders visible peoples content and interaction in the highly mediated environments of social media platforms? By creating a peoples dashboard, which content is detectable as human-driven or machine-driven ? In this research two topics had to be explored in order to create a plugin with the purpose of critically analyze social media platforms. The realization of this project involved focusing on the topics of dashboard/interface critique and social media platform critique. Problems regarding these topics are: finding the social in social media, transparency in the representation of data displayed on dashboards and the effect of algorithms manipulating human data. Questions that needed an answer or a point of view were: Where is the social in social media? and How can we identify data generated by people and distinguish them from data produced by algorithms by the platform?. In The Like economy: Social buttons and the data-intensive web Gerlitz and Helmond identify and follow the data flows that emerge from the Like button on Facebook, taking into account the politics of this specific platform (Gerlitz, Helmond 2013: 2). On the one hand the act of Liking can be seen as a social gesture and categorized as data produced by human, on the other hand: the metrics of the Like button are algorithmically constructed and changed every time the Like button is pressed, and can thus be seen as platform driven. To identify data produced by people is a daunting task: often the two are mixed, as shown in the example of the Like button. No data is by nature purely peoples data, and no platform is by nature purely algorithmic. As Astrid Mager advocates: [...] algorithms, like all other technologies, should not be understood as merely technical [...]. Rather, they should be seen as socially constructed entities mirroring and solidifying socio-political norms and values. (Mager 2014: 61). Every platform has its own unique technical infrastructure that affects how data is treated. However, in order to work towards a peoples dashboard and a plugin that creates a more transparent layer on the interface of social media platforms, we need some sort of consensus about what can be considered to be more peoples data than platform-driven data. Comments (without spam created by bots), in that sense, might be the purest form of content generated by people on a platform without interference of an algorithm that recommends, reorders or affects this act in some sort of way. Metrics describe or quantify a state, i.e., characteristic, or a process, i.e., a dynamic, trend, or evolution. (Kay, et al 2013: 3) To strip a platform from its metrics could be a way to make visible and set the focus on content instead of numbers. A social media platform without quantification could be the first step to find the peoples data. A second step in the process of identifying peoples data could be to change the concept of metrics and turn it into our favor. By removing the automation (the metrics that are based on user interactivity) we can move towards what can be considered to be peoples metrics instead of platform metrics. Having investigated ways in how to distinguish peoples data from platform-driven data, our next concern is to think about how this plugin can actually function as a critical layer on top of social media platforms. How should we define this critical layer? And maybe more importantly, what makes this layer to carry the name: critical? An interface is a point where two systems, subjects, organizations, etc. meet and interact (Oxford Dictionaries 2014). "Usually, an interface is understood as a technological artefact optimized for seamless interaction and functionality.[...] It is a cultural form with which we understand, act, sense and create our world. In other words, it does not only mediate between man and computer, but also between culture and technological materiality (data, algorithms, and networks)," (Andersen, Christian, and Søren Pold 2014: 1). Social media platforms are interfaces that enable the user to socially interact, mainly through an arrangement of graphical features like images, buttons, text fields, links, etc. Interfaces are a layer on top of the script of the website like the skin from our body. An interface hides the exact workings of the mechanisms of a social media website, making it easier to interact with it without getting distracted. A characteristic of this graphical layer is that it displays data in a simplified way through graphical features mentioned earlier. On Facebook, the Like button is a very straightforward symbol that represents a social gesture of liking content, giving it a thumbs up. On the platform level the Like button represents a function that counts the amount of likes and changes it value with +1, every time the Like button is pressed. The Like button is thus a simplified way to represent the data in the interface. A consequence of simplifying data is that it makes the platform less transparent. In this project we are trying to realize the opposite: making the workings of the platform more transparent, highlighting and thereby distinguishing human-driven data from platform-driven data. By creating an array of critical layers from the social media platforms and making a collage , we are able to visually compare them. This collage of critical layers of social media platforms can also be thought of as a dashboard, or to be more precise: a Critical Social Media Dashboard. Dashboards are [...] In simplest terms, they are single screens that aggregate and display multiple flows of data. Dashboards are a way of relating to a world manifested through data, somewhere between glancing and monitoring, of selective interaction, of lean back governance, constantly in motion. (Bartlett, Tkacz 2015: 1) In this project the Critical Social Media dashboard is a static dashboard, it contains time-freezed snapshots from the different social media platforms. The plug-in however counters this shortcoming, as it can be turned off and on dynamically whenever the user wants. 1. How to create a Critical Social Media Dashboard? To create a critical peoples interface or dashboard, we selected six different social media platforms: YouTube, Facebook, Twitter, LastFM, LinkedIn, and Instagram. For each of these platforms we marked each features as one of four categories: platform, people, mix, and navigation. In order to discover peoples data, we performed an interface analysis by collecting the language and all elements from the various platforms. By zooming into these sites, we started to divide peoples raw content, that is non-automated data from data which is influenced by algorithms. By examining each of these features, we aim to create a critical layer which users can see the platform-driven elements of the interface so that users know what is human and what is not. The platform drive data are those elements that are pushed by the platform, either algorithmically generated or promoted commercial content. Examples of this includes ads, promoted content, friend suggestions, content recommendations, trends. The peoples data are those elements that invite or reflect user contributions and interactions. Consider ones username, profile picture, posts, tweets, uploads, comments, like, favorite, share, invitations, and others. Without further re-ordering or re-ranking. The mixed elements are made up of peoples data and content that have been re-ordered, re-ranked, rearranged and recommended by the algorithms of the platform. The news feed, activity feed, sticky content, birthday notifications, group invitations, have all been considered as mixed content because of how they can be pushed to the top of the feed. Finally, the navigational elements are any which guide a user through the platform. This includes: home, search, settings buttons. Using these categories, we then took screenshots from multiple pages of each platform in order to analyze their humanness. In order to estimate the humanness of a page, we will count the number of elements present in each section to see how much humans may or may not dominate the page. As a part of building this research we wanted to build a plug-in so that anyone interested in learning about the nature of the platform that they are using can do so. In order to create a Firefox and Chrome Plugin with Peoples Content Invitation Dashboard mock-up, we had to find all the HTML objects corresponding with the previously listed features of the page and extract their class and/or id. Based on that we wrote a CSS that overrides the native style of these elements. In this way we could colour-code the previously established distinctions on top of chosen platforms. The peoples dashboard demonstrates how the selected platforms manage peoples content on their sites in a static way.The People's dashboard is implemented as a user script which can be installed in GreaseMonkey (Firefox) or TamperMonkey (Chrome). Currently only the People's Dashboard is only implemented for Facebook With the installation of the plugin, available on GitHub http://bit.ly/peoplesdashboard, the social media platform Facebook can be experienced as a real-time dashboard. The special feature let the interface of the personal Facebook page appear in colours, referring to the people, platform, mixed and navigational data identified on the site. The plugin has been programmed in order to empower people to critically engage with social media and detect which content is actually people-driven or not. Finally, in what has been dubbed the Toney Roney Experiment , we wanted to create a new profile and observe how it becomes populated as a new user gets started. Where in the interface to people start appearing? This was done for three platforms:LinkedIn, Facebook, and Twitter. We started each platform with an empty profile. We aimed to have it as clean as possible, by signing up with newly made email addresses. Ideally, we would have used an incognito browser, however this meant that the screenshot plugin of choice would not work. Additionally, Facebook requires verification with a real phone number, in a possible attempt to keep out spammy or fake accounts. These two things meant that the platforms did have some basic information about Toney Roney. In order to observe how the platform became populated, we measured the platforms at three stages, First with no friends/connections or followers , then with only one friend, connection, or follower, and finally with eight friends, connections or followers. The same categories were used to describe the features on each platform. Algorithms are simple and enable multiple and constant reconfigurations of its elements, creating new possibilities which combine predefined with new data. As we begin to understand complex systems, we begin to understand that we are part of an ever changing, interlocking, non-linear, kaleidoscopic world. [...] the elements always stay the same, yet they are always rearranging themselves. So its like a kaleidoscope: The world is a matter of patterns that change [and have continuity], that partly repeat, but never quite repeat, that are always new and different, (Mahnke and Uprichard, 2014: 260). Zooming into the social media platforms, we investigated how much the kaleidoscopic dynamics of the algorithms influence the social within the platforms. Are we able to situate the different platforms in terms of peoples data; grey area and platform-driven data? How are the platforms ranked? The experiment with the empty research profile Toney Roney, which has been performed within the social media platforms LinkedIn, Twitter and Facebook, makes visible that each platform expands differently the more the platform becomes populated. To create an account on the worlds largest professional network, the user needs to sign up with an email address as mentioned in the methodology chapter. One of the peoples element we encountered on the site is the option to post an update, called share an update . Although users have the option to add content here, the prompt is highly precise and limits the users engagement with the platform to a certain degree. In general, peoples data on the platform is very much confined by suggestions, ads, and promptings to complete the profile. The section newsfeed becomes only visible after the first connection with another user and after eight requests to connect, new metrics and connections appearing and showing how other people have engaged with the platform, meaning thatLinkedIn populates the newsfeed with activities of your connections prior to your connection with them. As the user cannot increase human data on the site by adding connections or posting an update for instance, the networking site is predominantly platform-driven and thus peoples data and the existence of the social seems absent. By signing up and opening an account on Facebook, the user is not entirely involved within the platform yet. Even though the site provides the user with a list of potential friends, the ability to add them is not given.Therefore, it is necessary to be requested by another user, accept the request and have at least one friend in order to use the account and interact with the site properly. With this rule, Facebook seems to check a users humanness and makes sure that only people can start being social on the platform (see image 1). The experiment outlines that the more the user engages with the site (after the first connection, the user is able to interact, post, share whatsoever), the more peoples content is produced and populated on the site. However, in the example of Facebook it is clear, that although peoples content increases, the platform does not disappear, rather it is more a correlation which can be termed as mixed data as people and platform cannot entirely be distinguished. 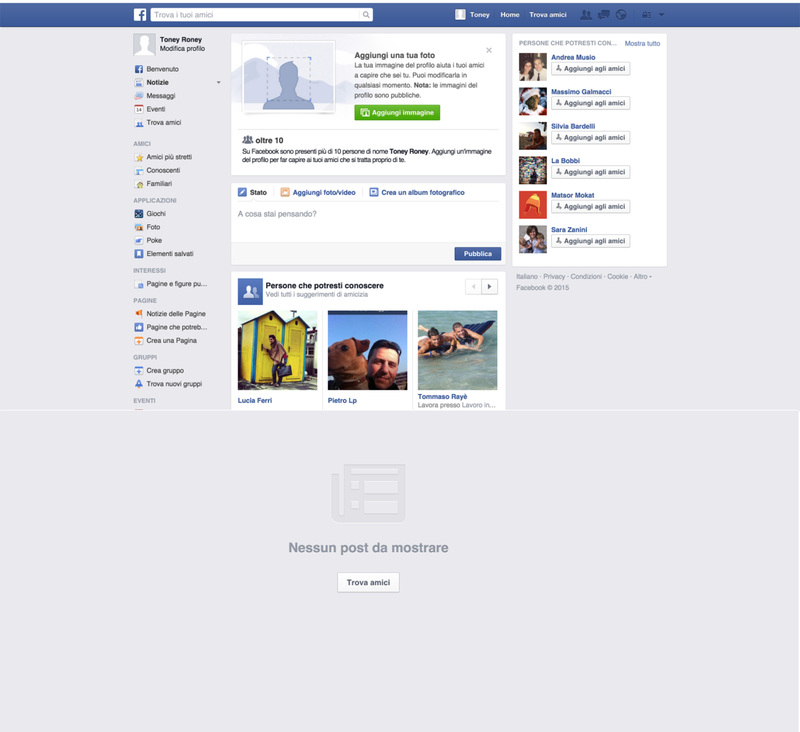 Image 1: Facebook depopulated, potential friends with no add button. With the creation of a new profile, Twitter immediately starts pushing content and tries to involve the user into the ongoings of the platform. Significantly, the first feed pushes the users content after one connection to another user is established (follower), Twitter stops making suggestions and is considerably quiet. What is unique about Twitter, is that unlike Facebook and LinkedIn, the platform does not load the previous activities of those you follow, the platform only becomes loaded with the Tweets written after you have started to follow, speaking to the nowness of the platform. Nowness also in terms of social because overall, the experiment shows that Twitter is the most people-oriented site due to the reason that the influence of the platform diminishes when the platform becomes more populated. The results of the Toney Roney experiment show that the social- hence the human-driven content becomes more or less visible depending on how much the user interacts with the certain platform (see image 2). As outlined above, Twitter allows its users to produce relatively much data, whereas LinkedIn users are less able to contribute data the more they engage with the platform, rather the platform-driven data stays highly dominant. Overall, monitoring the interaction with the networking site from an empty profile has revealed that peoples content influences the platform in different ways. Nevertheless, since we are not able to entirely detect and define what is actually people and machine driven, the relationship between algorithms and the social seems highly complicated (Mahnke and Uprichard, 2014: 261). Apparently, the creation of a peoples dashboard, through analysing people-, platform- or mixed elements within the selected networking sites Facebook, Instagram, LinkedIn, Twitter, YouTube and LastFm, underlines the complex connection between platform and peoples content. 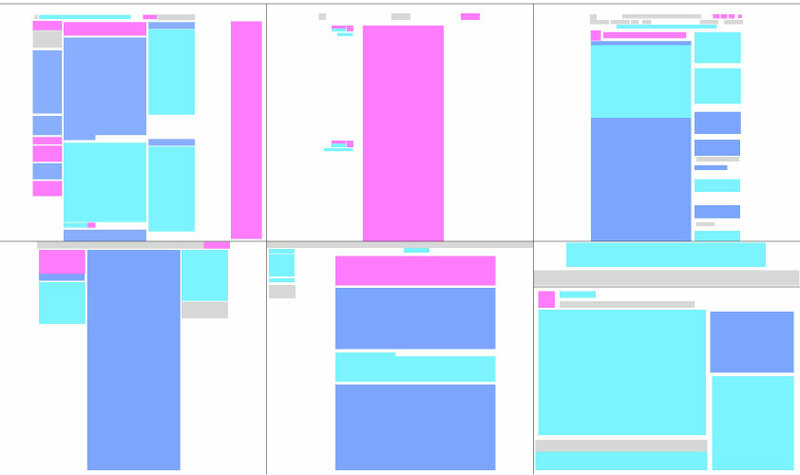 The following (see image 3) shows the different platforms colored, referring to the influence of people (magenta), platform (cyan), mixed (dark blue) and navigational content (grey). The sites are in the correct order as listed in the previous paragraph. Regardless of the navigational data, the colored interfaces show the amount of platform versus peoples data which makes a ranking from less platform-driven content to more people-driven content possible. Our initial findings indicates that Instagram and YouTube are the most social and human-friendly platforms, whereas Facebook is more algorithm-oriented which makes it difficult for peoples data to exist or increase. The sites Twitter, LinkedIn and LastFm are positioned inside the grey and mixed area and therefore include many elements considered to be influenced by people as well as by the platform or put it differently, people's content that has been algorithmically rearranged. Although it is increasingly difficult to completely separate human and machine content, it is possible to recognize differences in the way each of the platforms deals with this subject. Some of them prioritize human content while others have a bigger algorithmic influence in the display of information and the process of populating the platform. Regardless, we find this to be a good start to researching the peoples data in social media. With time one could create more refined categories and analyse the pages better. Perhaps based on the amount of the page dominated by human features, rather than the number of human elements. Andersen, C. and Pold, S. Manifesto for a Post-Digital Interface Criticism. New Everyday. Media Commons, New York University (2014). Andersen, C.and Pold, S. Interface Criticism Aesthetics beyond the Buttons. Aarhus: Aarhus UP, (2011). Brügger, N. ; Finnemann, N. O. The Web and Digital Humanities: Theoretical and Methodological Concerns. Journal of Broadcasting & Electronic Media. (2013) Vol.57 (1), p.66-80. Gerlitz, C. and Helmond, A. The Like economy: Social buttons and the data-intensive web. New Media & Society (2013). Mahnke, M. and Uprichard, E. Algorithming the Algorithm in Society of the Query, Reader. Institute of Network Cultures. Amsterdam. (2014) Pages 256-270. Peters et al. Social Media Metrics - A Framework and Guidelines for Managing Social Media. Journal Of Interactive Marketing (2013) Vol.27 (4) pp.281-298.